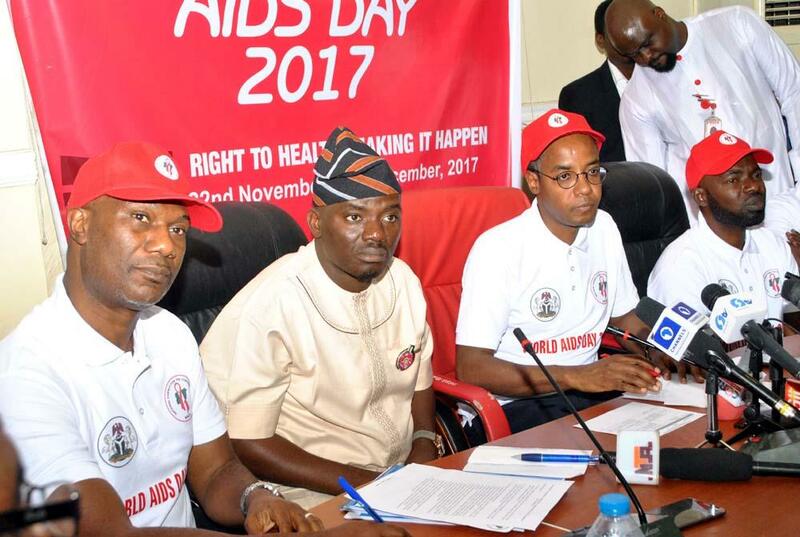 Abuja, 22 November 2017 — Events to commemorate the 2017 World AIDS Day have commenced with a call on all stakeholders to work towards realising the right to health for all Nigerians as a means to ending AIDS by 2030. This year’s commemoration is taking place under the theme: Right to health – Making it happen. “Every Nigerian has a right to good health. We have a responsibility to ensure that this basic right is available to all Nigerians. The Government is committed to enhancing ownership and sustainability of the HIV/AIDS response,” said the Director General of the National Agency for the Control of AIDS (NACA), Dr Sani Aliyu. One of the highlights of this year’s national commemoration will be a formal ceremony with participation high level government officials, representatives of people living with HIV, development partners, as well as adolescents and young people. Participants will listen to discussions on issues related to funding and ownership of Nigeria’s HIV response. Other events lined up for this year’s commemoration include HIV counselling and testing at selected sites, a candlelight event, football and other games, social media engagement with adolescents and young people, as well as awareness talk-shows on radio and television. World AIDS Day is commemorated on 1 December each year to unite people around the HIV/AIDS response, show support for People Living with HIV, and remember people who have died of AIDS. Ahead of World AIDS Day, UNAIDS launched a new report titled Right to Health showing that access to treatment has risen significantly, globally, from just 685,000 people living with HIV accessing to antiretroviral therapy in 2000 to 20.9 million in June 2017. South Africa had the largest number of people on treatment, at 4.2 million, followed by India, Mozambique, Kenya, Zimbabwe, Nigeria and Uganda, which all had more than one million people on treatment. However, Nigeria’s HIV response remains largely donor driven. “Nigeria’s government should own up to the HIV and AIDS response. Putting money into the national response is an investment in humanity. Our continuous access to medication and our right to healthcare is a fundamental right. Government should make it happen,” said National Coordinator of the Network for the People Living with HIV, Victor Omoshehin. “UNAIDS recognises President Muhammadu Buhari’s new commitment to maintain 60,000 people living with HIV on treatment and place an additional 50,000 more on treatment each year, using domestic resources. But we must work as quickly as possible to ensure that Nigeria funds and owns the HIV response,” said the UNAIDS Country Director for Nigeria, Dr Erasmus Morah.